Hi everyone! 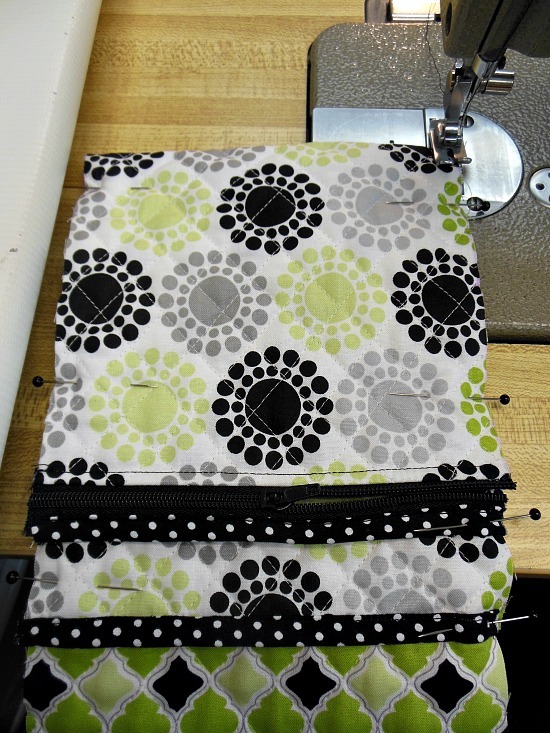 This is Jann Newton from Newton Custom Interiors with a tutorial for a cute tablet cover with a zippered pocket for earbuds and/or charger! Tablets or readers have become very popular in the past few years, but most of them don't come with a cover to protect them. 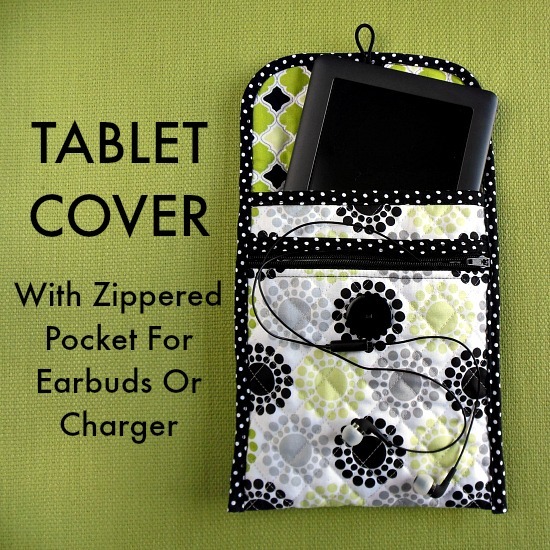 I love my Nook reader, and I decided that I wanted to create a cover to protect it, and wanted to add a zippered pocket for my earbuds. 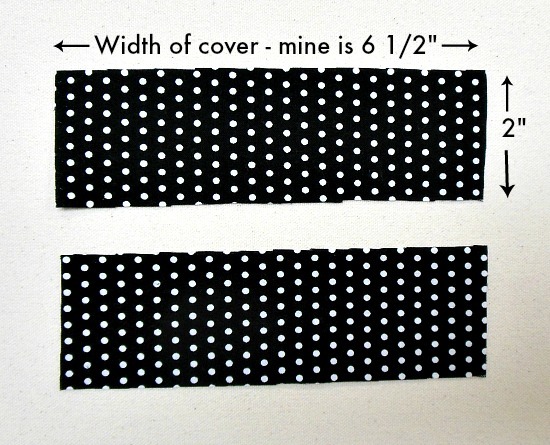 3/4 yards of a reversible quilted fabric – a thin layer of batting is sandwiched between two different fabrics and then quilted. (I couldn't find a quilted fabric that I liked in my local fabric stores, so I bought two different fabrics – 3/4 yards of each – and quilted them myself). Here's a picture of the 2 fabrics with the batting in between. *These figures are to make a cover for my Nook, which is 5″ wide x 8″ long. 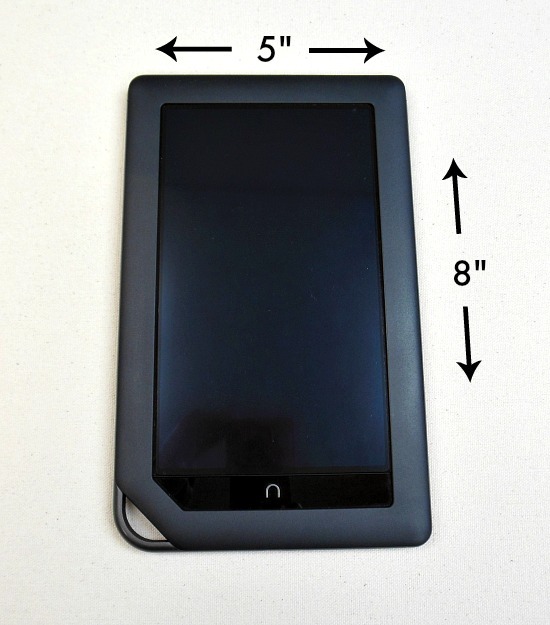 You will need to measure your tablet or reader, and adjust your measurements accordingly. Cut a rectangle of fabric that is 1 1/2″ wider than your tablet, and double the length of your tablet plus 4″. Since my Nook is 5″ wide x 8″ long, I cut my rectangle at 6 1/2″ wide x 20″ long. Round the corners at one end of the rectangle. I used a spool of thread to mark the curves. I wanted to use a coordinating fabric for my binding, but I wasn't sure what was the best way to make it. 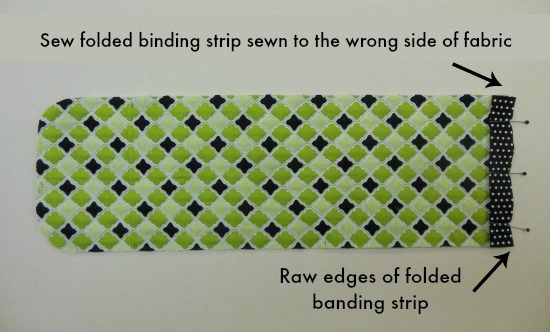 One day I was watching a Craftsy sewing class taught by Annie Unrein – Sew Sturdy: Home Organizers, and was thrilled to see that she taught a technique for making bias binding. 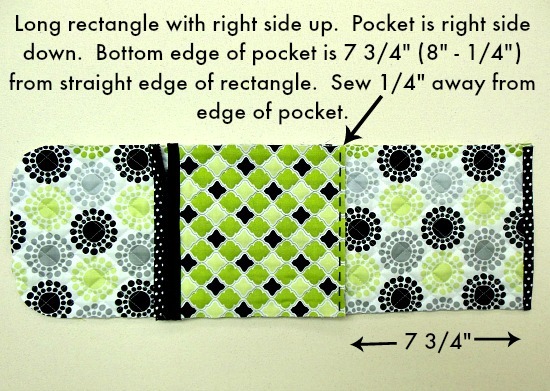 For this tablet cover you will need to cut 2 strips of the coordinating fabric. 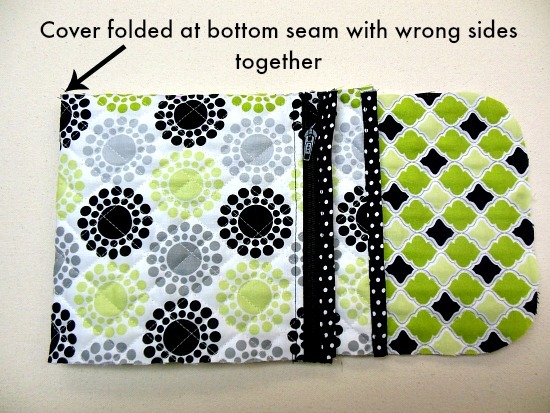 One will be for straight end of the rectangle and the other for the the top of the zippered pocket. They should be cut the width measurement of the cover x 2″. I did not cut these on the bias. I also cut a 35″ strip on the bias for the binding that will go all around the edges of the cover in a later step. 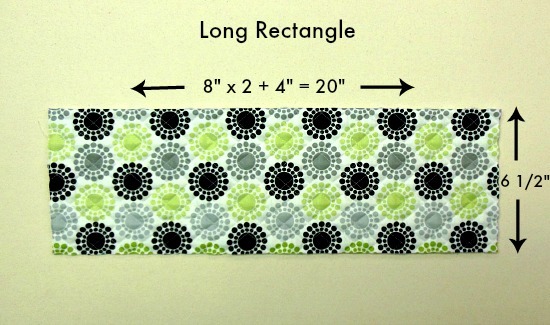 I'm going to show the steps to add the binding strip to the straight end of the rectangle. You will use these same steps to apply the strip at the top of the pocket and the bias strip for around the whole cover. Fold strip in half lengthwise. Don't iron fold, just pin. 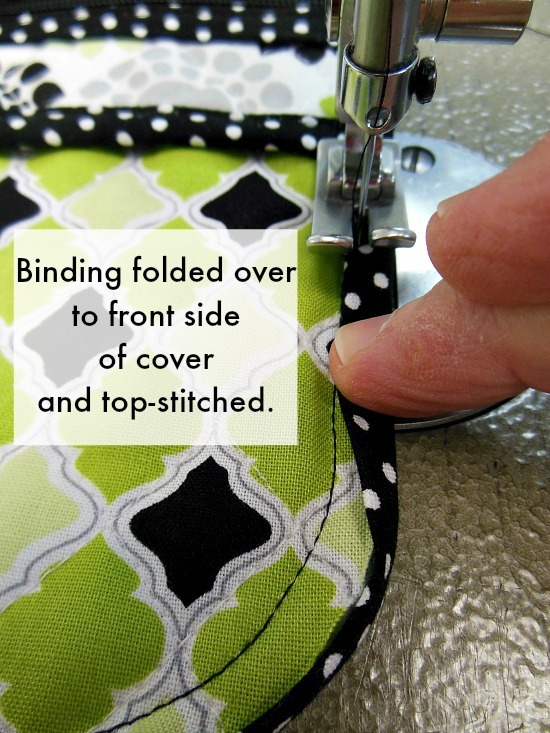 This was a good tip from the Craftsy class, if you don't make an ironed crease in the fabric, then you can adjust the binding if you need to and the crease won't be in the wrong place. To apply the binding strips, sew the strip to the wrong side of the fabric using a 1/4″ seam allowance, raw edges of the binding strip along the raw edge of tablet cover rectangle. Fold the binding strip over to the right side of the fabric. Top stitch binding strip in place along folded edge. 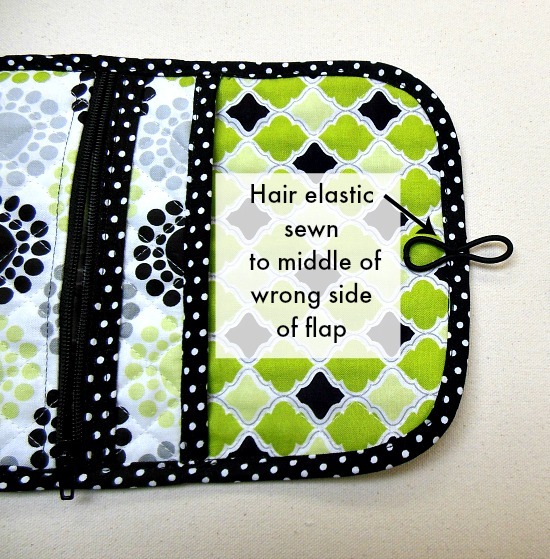 Annie Unrein's Craftsy class also included a lesson for adding a zippered pocket to a bag. It was the perfect solution to adding a zippered pocket to this tablet cover. Cut out a piece of fabric for the pocket that is the same width as your long rectangle and 1 3/4″ less than the length of your tablet. My pocket was cut at 6 1/2″ wide x 6 3/4″ long (8″ long minus 1 3/4″). 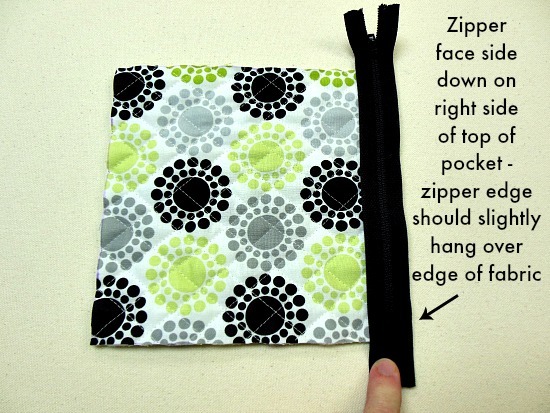 Lay your zipper face side down on the right side of the top of the pocket fabric. You can let extra length of the zipper hang over on each end, it will be cut off later. The long edge of the zipper should slightly hang over the fabric. 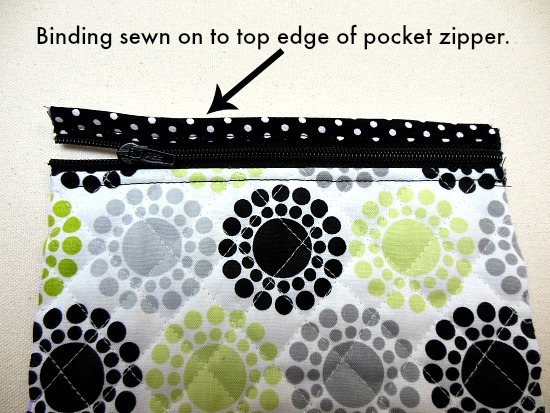 Sew the side of the zipper closest to the edge of fabric – 1/4″ away from edge of zipper. 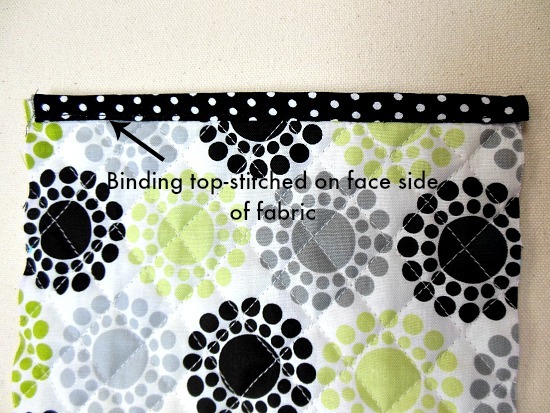 Fold fabric so that the zipper is face side up. Turn fabric and zipper over to back side. 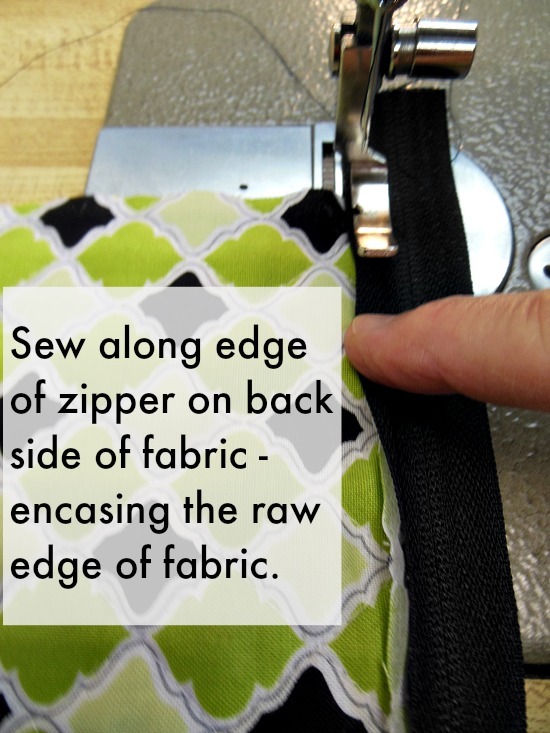 Sew along the edge of the zipper on the back side – encasing the raw edge of fabric. Attach binding to the other edge of the zipper the same way that it was attached to the end of the tablet cover. Lay the pocket on the cover rectangle, with right sides together, with the bottom edge of the pocket the length of your tablet minus 1/4″. 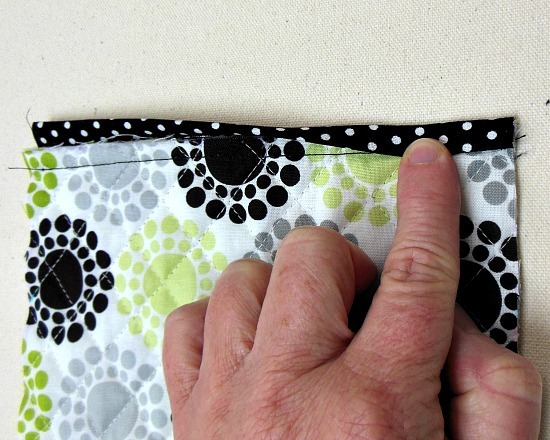 Sew pocket to the long rectangle 1/4″ from the raw edge of the pocket. 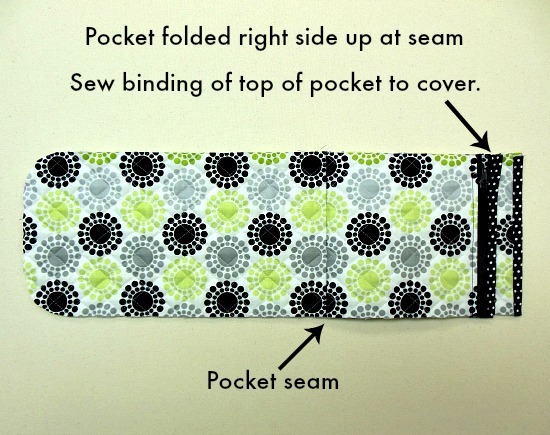 Fold pocket at seam so that it is right side up on the long rectangle. Stitch the top of the pocket to the cover. Fold the cover at the pocket seam line. Pin all layers of each side of cover. 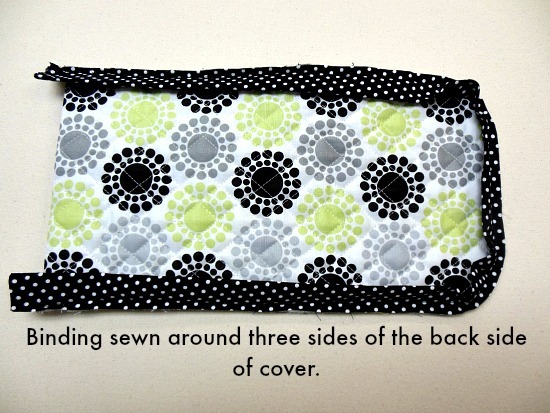 Sew the sides together, wrong sides together, with a 1/8″ seam allowance. Sew binding around the cover on the back side, following the binding instructions above. 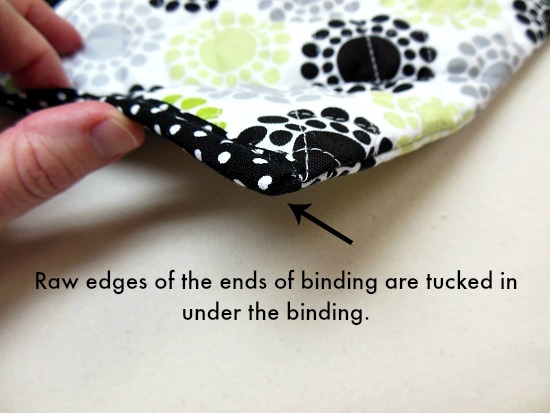 Turn under the ends of binding so there are no raw edges. Tuck under the ends of binding so there are no raw edges. Fold binding over to front side of cover and top-stitch in place. 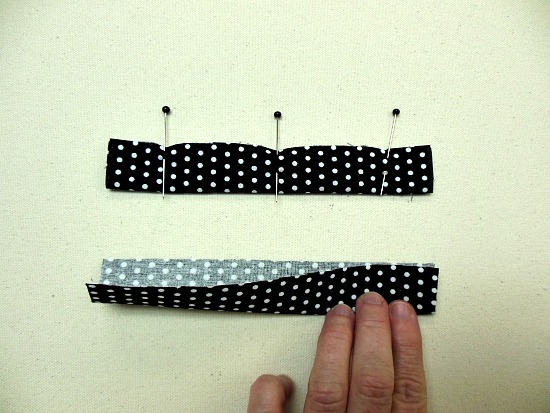 Sew hair elastic to the middle of the underside of the flap. 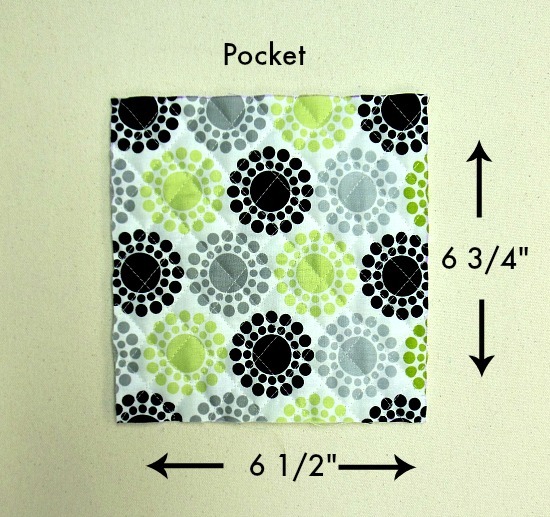 Sew button onto pocket front. You're done! 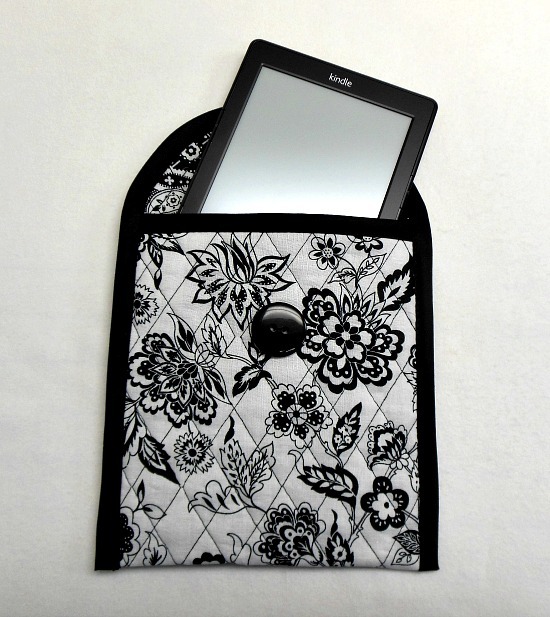 Enjoy your new quilted tablet cover with pocket! If your charger for your tablet or reader is not too large, it may fit in the pocket too. You could always make your cover a bit wider to make extra room for the charger. If you don't need a pocket for your cover, I've also made a cover for my Kindle reader that doesn't have a zippered pocket. Go for it Mary, do let me know how you found the project. Thank you for sharing your project steps. This was such a helpful tutorial and I love the fabrics you chose. 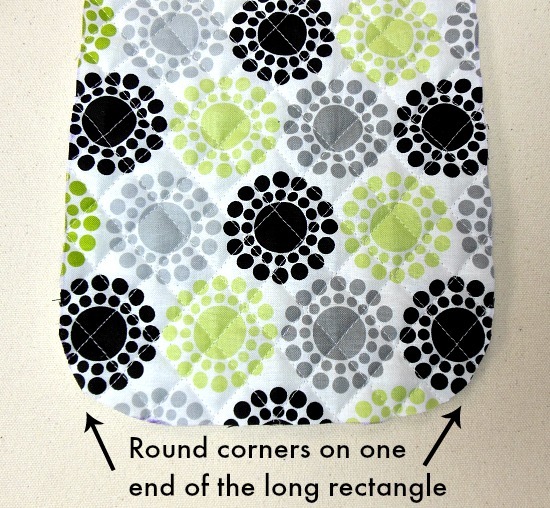 So cool how you lined up the print fabric so that the button went right in the middle of the circle. I made my measuring adjustments to make a cover for my iPad. However, I think the next time I’ll try to make it wider and longer. 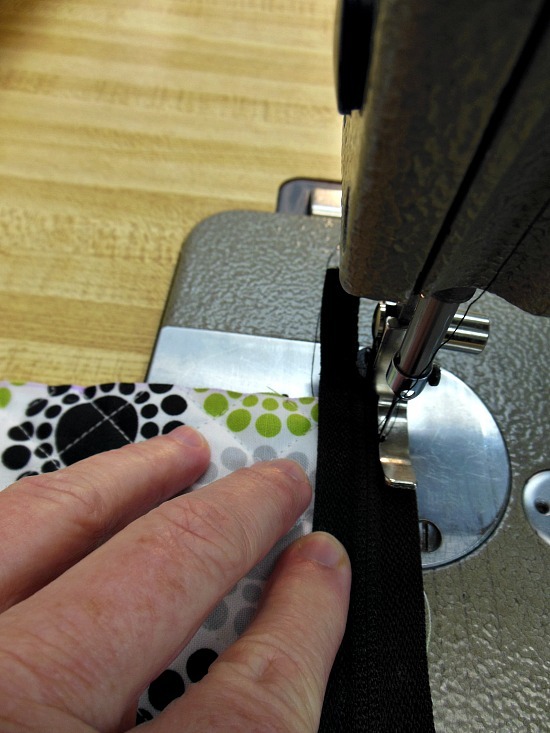 It was fun to learn 2 new things for this project… quilting and bias tape making. I am only half way through- being away from home & my sewing machine and in need to do something creative I am sewing by hand which is slow but relaxing. Congratulations this is a lovely bag, I also sew by hand when a machine is not available. Can you explain it to me…. I have a whole bolt of printed musical fabric. I think will use it to make a few of these. I will use them for gifts for my sister’s voice students. I will have to order bulk zippers to keep the cost down. Hi Cathy you need to read the article it gives you the measurements. I’m a little confused, if the pocket is cut the same width but 1-3/4″ shorter than tablet length & tablet is 8″ long, wouldn’t it be cut at 6-1/4″ not 6-3/4″ as you have pictured above? Just want to make sure I’m understanding this. I am making the bag for my tablet. But I noticed that the 9″zipper was too big and used a 7″ instead. Was I wrong? No if it worked for you. I am thinking about making this, it looks like a great case. Would you consider this project beginner friendly? HI Kiki, I think you should be fine as a beginner. Hi Jaime, thanks for letting us know. Glad your project went well. Jaime – what a great idea to use this type of bag for a coloring book and colored pencil holder! I’m glad you liked the bias tape! I’m a little in love with the fabrics you used. Where are they from and where can I get them? Thanks! I love these fabrics too. I purchased all three of them at my local Hobby Lobby store this post spring. Thanks Jann, really good tutorial. Just made one for my husband’s new “toy” & he’s thrilled with it. Thanks Carol! I’m so glad that the tutorial was helpful, and that your husband likes his new tablet cover. I just made one for my mom for her new iPad, and she loved it too! This is a really nice tablet cover, I love the useful pocket! Thanks for explaining this tutorial so well, the pictures also make it very clear. I featured the tutorial on my blog, click here to see it. Thank you so much for featuring and linking back to this tutorial on your site – its one of my favorites too. I was interested in your how to sell patterns article as well. Thanks for dropping by. I’m glad you also like my article, thanks! Great idea to have room for cable and charger in the one case. Fabulous design, Jann!!! Thanks so much Pam, you do wonders for the online sewing community. I’m a NEWBIE here, how did you “quilt” your fabric at the very beginning? You can usually buy pre-quilted fabric at your local store, or somewhere like a JoAnn. If not, then yes you would pre-quilt the fabric before cutting out the pieces you need, because it will shrink up a little as part of the quilting process. 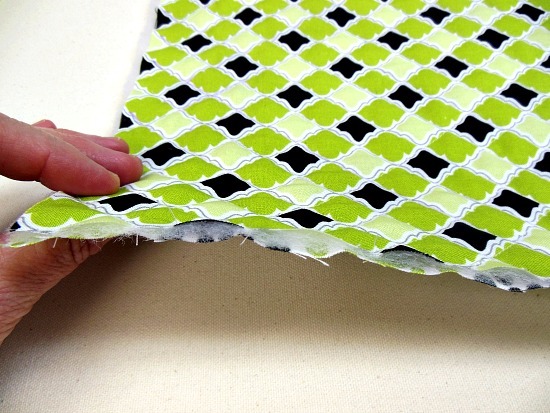 Do you have a tutorial on how your quilt your fabric? Not directly, but its pretty easy. You can add a fleece or a low loft batting between two pieces of cotton, smooth it out and add some pins to keep things in place. Make sure the fabric is facing right sides out top and bottom. Then draw a line somewhere down the center and sew through all the layers on that line. Then you can either measure and mark your next line, or you can use your presser foot as a guide. Sometimes they also come with a guide you can slide in which keeps your lines even. Work out a line at a time from the center in each direction, smoothing the fabric flat as you go. Once you’ve done one way, switch around and draw a center diagonal line to make a diamond pattern and work out from that line again until all your fabric is quilted. Then you cut the quilted fabric into the pieces you need. Hope that helps. Deby, thanks for answering this! Yes, that’s how I quilted the fabric. It was not intentional when I bought the fabric for the inside of the case, but I ended up being able to use the diamond pattern in the fabric as a guide. Pinned all the layers together, and then started in the center rows working out to each side both directions. Thanks so much Anne ! 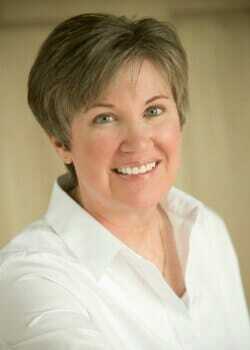 Awesome Jann! and as usual I love your fabric choices!! Pinning! !